As we know, Blu-ray movies is becoming a hot topic nowadays. If you are a movie lover, you would like to enjoy the fantastic effect of Blu-ray movies. We can rent the latest movies from the shop and enjoy them on our PC. While there still exist problems, if we want to enjoy the movies on go anytime. How can we solve this trouble? I still remembered how cheerful I was when I got iPhone 3G S soon after Apple first released it, and how depressed I was when I added MPEG-4 AVC movies to it but it did not work. After that, I was thirsty for finding out a video converter for Mac to solve my problem. I found a program called EarthSoft Bluray Ripper, which can rip Blu-ray to MPEG-4 AVC for iPhone. You just need to add your Blu-ray movies, select output format and click the "Start" button, then you will get the format you desire. 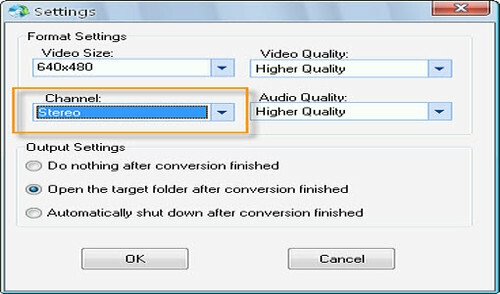 You can also set up your output channel to stereo. Recommending a Great DVD Player! Plays DivX for torrents, USB for Flash & External drives, HD & CHEAP! R.I.P Roger Ebert. Or Shall We Say ... DARTH VADER? !